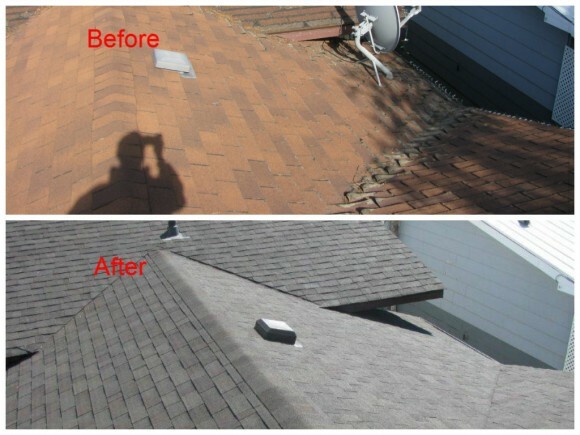 If you have been experiencing problems with your roof, don’t leave the issue unresolved. Talk to one of the professionals at any of our locations in Calgary, Edmonton , Saskatoon and Red Deer. Have us complete the needed repairs, and save yourself money, time, and stress down the road. If you’re looking to install a new roof, visit our Roofing page for more information. When Do You Need Roof Repairs in Alberta or Saskatchewan? Whether you live in Red Deer or Saskatoon, roofing problems can escalate, eventually requiring an entire roof replacement. To avoid future issues and expense, we recommend that you do a visual inspection of your roof twice a year. If you notice any of the following signs, call us immediately for a complete and professional roof inspection and repair in Calgary. Streaking Stains – These stains could result in further water damage to the roof or house structure if not addressed. Curled or Buckled Shingles – Damaged shingles can allow water to find its way under the roofing material, causing a leak in your house. Water Stains, Moss, or Mould in the Attic – Any of these problems could be a sign of a roof leak, and they will likely get worse if not discovered and repaired. Your home is likely your biggest investment. Taking care of the roof protects your home from possible water damage, which can be expensive to repair. If you have an older roof, a complete replacement not only gives you more protection, but it will increase your home’s value and curb appeal. It also seals your home to prevent heat loss, saving you on your energy bill. Why Rely on Great Canadian? Our professional roofers at Great Canadian know what problems to look for on a roof. Some issues are nearly undetectable. Leaks in the ceiling of your home could be caused by damaged shingles several meters away. We know how to track down these illusive problems so they can be addressed correctly. Call us for a complete inspection of your roof. Great Canadian’s workmanship guarantee, combined with the highest quality roofing materials backed by manufacturers’ warranties, means you will be fully satisfied with our work. If you are in need of roof repair in Edmonton or Calgary, call Great Canadian Roofing & Siding to make an appointment before harsh weather has a chance to damage your roof – and possibly your home. Protect your investment and your maintenance budget by setting up an inspection today! Fill out a free online form!